If you’ve visited our property lately, you may have noticed that the hillside leading to our upper vineyard is blanketed by brand new plantings, now fully emerging from their protective housings. In March, we realized a long-time goal to add an additional one-acre block to our existing 13 acres of planted vines. This goal arose from a desire to round out our esteemed estate Rhône program with something we felt it was always lacking: an estate GSM blend. With such a small amount of planted Grenache and Mourvèdre, we were never able to dedicate enough of these varietals to a blend without compromising the single varietal bottling production. Now, this acre of Grenache, Syrah, and Mourvèdre will serve to enrich our Rhône program and provide us with what will eventually be a marquee reserve wine for our brand. Under the guidance of vineyard manager Ruben Solorzano, owner Martin and Isabelle’s children Adele and Arthur put the first vines into the ground along with the whole Rideau team. 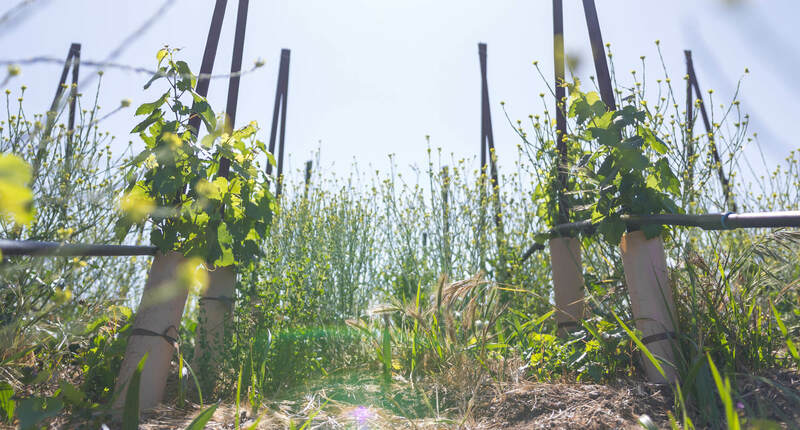 Unlike many California plantings, these vines are own-rooted, which means they were not grafted onto American rootstock but rather planted straight into the ground. (Click here to watch a description of how the vines are planted). With own-rooting, there is potentially more variability from year-to-year, but the fruit flavors will not be influenced by the rootstock. Solorzano brought his decades of experience to this project, suggesting a tightly-trellised planting pattern that would yield just enough highly-concentrated fruit to create this yearly blend. Tight spacing stresses the vines, producing smaller clusters with smaller berries. This results in a higher skin-to-pulp ratio and higher intensity wines. We’ve long worked with excellent vineyards in the region to produce GSM blends, but we’re very excited to finally feature the unique richness of our own terroir for this traditional, desired blend. You’ll have to tide yourself over on our other excellent wines for a while, though—the first vintage of our estate GSM will likely be 2019. In the meantime, feel free to come visit and peek at the new planting. For a closer look, join our wine club and get a special tour of the vineyard where you’ll learn all about what makes this particular planting and our whole site so special.